international music magazine is a magazine publishing company that provides artist a worldwide platform to network among themselves and their fans. this very 1st edition features underground rappers jeremy gomez on front and ceabruz on the back cover.it has also worlds famous rappers like OG Rome, Tee Will, Mizz NeNe, Boonkey, Pilotboy, Henry Mckinght and some asian artist from Pakistan Chen-K & Waqar Raaj. IMM is designed to give maximum exposure to indie artist worldwide. IMM is based around artist who are creating a buzz for themselves and is a promotional and networking tool to get them closer to the "dream". 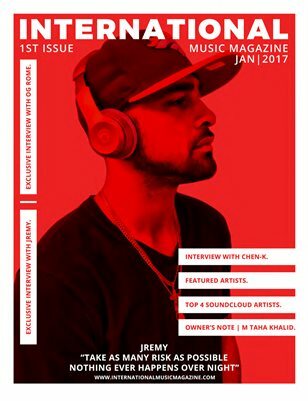 This 1st issue features some of the hottest indie artists of whom to watch out for in 2017. IMM creates buzz and will give some artists their first taste of fame. our goal and mission is to become the number one magazine publishing company that gives indie and upcoming artist international promotion in major media/social media outlets.